Recently it dawned on me that Amy Robson- the jeweller and Amy Robson (or Amy Rad as most people know me)- the surfer from Maroubra don’t need to be separated into two images/personalities/identities as they are clearly both me (duh, I know that sounds stupid). All the facets of my energetic and sometimes crazy personality influence what I do in my jewellery business and my lifestyle so why not just let that be the foundation for what I show the world and how I communicate ME. Embracing my local pride for Maroubra Beach snow-balled this realisation that most people in my hood only know me as Amy, the kook surfer with the big smile. 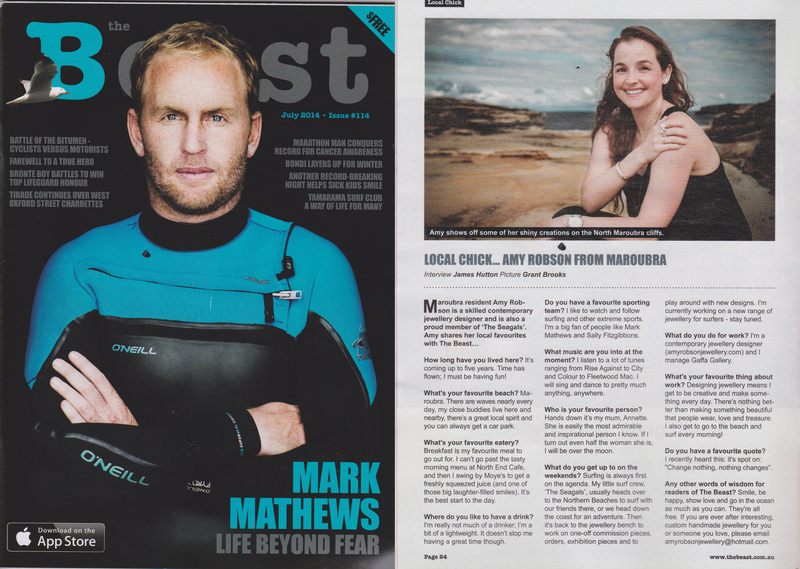 I wanted to get to know my tribe better and show them there is more to me than my goofy poo-stance (fellow surfers will get what I mean) so I put my idea to a local publication called The Beast. The Beast is a monthly read that prints over 61,000 free copies every month for the Eastern Suburbs of Sydney community. Check them out http://thebeast.com.au . Have a read or just do what I do, look at how hot Mark Matthews is!!!! Surfing and being a jeweller will always go hand in hand for me. Stay tuned for some new pieces I have been working on that are designed for….. wait for it……..SURFERS! I look forward to sharing the new jewellery with you really soon.